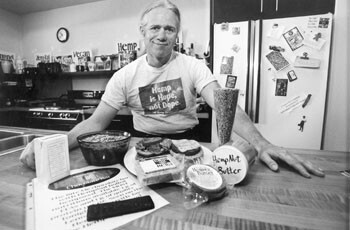 Fiber optimism: Richard Rose's Sonoma County-based HempRella markets a variety of foods manufactured from hemp. As acceptance grows for hemp products, industry figures are vying for the hearts and minds of consumers. IN EVERY ELECTION CYCLE, there are initiatives that fall by the wayside. Some regroup and achieve ballot status the next time around; others are never heard from again. Legalizing the cultivation of industrial hemp in California could go either way, but infighting among hemp proponents may be jeopardizing efforts to place the initiative on the ballot. Hemp, as any self-respecting counterculturalist knows, is marijuana's versatile but unsmokable cousin. Botanically different from the THC-laden buds that pot smokers prize, hemp is cultivated for its fibrous stalks and its seeds rich in essential fatty acids. Industrial hemp contains 1 percent THC or less. On the other hand, high-quality marijuana contains 10 to 13 percent or even more. But while potent pot has a single use, hemp can be used to create literally thousands of other products, from textiles to building materials, cosmetics to foods. "Hemp can be blended with just about anything," according to Mary Kane, publisher of Hempworld magazine in Forestville. "It is mold retardant, anti-fungal, and rodent resistant," qualities that benefit building materials, while the long hemp fibers weave easily with cotton and silk to create a wide range of textiles, from denim to linens, and even lingerie. "Dairy-type products are easy to make with hemp seed," she added. "You make a soylike milk out of it first, and then do whatever after that." Kane was among the hemp activists who had hoped to see a legalization measure on the California ballot in November. The Industrial Hemp Act was launched with modest fanfare early this year, with a call for hemp-related businesses and other supporters to round up half a million dollars to get the initiative qualified. Then ... silence. The qualifying process, which requires some 700,000 signatures of registered voters on petitions in support of the measure, was begun on a shoestring--and some petitions are still being circulated--but little funding was forthcoming, and the initiative failed to attain much momentum, or even publicity. "There wasn't enough money to pay signature gatherers," says Candi Penn, secretary of the Occidental-based Hemp Industries Association, a 280-member trade organization. Although the measure's proponents, who came together under the banner of CAIR (Californians for Industrial Renewal) lined up Orange County political consultant Sam Clauder to guide the campaign, his signature-gathering firm received scant resources, and achieved results to match. But Penn does not second-guess that approach. "I don't think there's been an initiative in California that didn't have that kind of support [signature gatherers] that made it," she notes. Kane agrees that the lack of financial support undid the high hopes she held for the initiative, and she blames dissent among the ranks within the world of hemp business people, a schism between the earthy, entrepreneurial "hempsters" and the more buttoned-down corporate types. "We could have had a nice initiative this year if certain people hadn't badmouthed us," Kane says. The "hemp right wing" poisoned the climate in Hollywood against the measure, she says, pre-empting any hopes of getting the hemp initiative bankrolled there. And who are these naysayers? "They're the corporate guys who are trying to get hemp corporatized," Kane fumes. "It is safe to say that there are individuals who would rather wait for the corporate people to take over than allow the hempsters to be successful with politics." But John Roulac, the Sebastopol-based author of Hemp Horizons and director of the North American Industrial Hemp Council, sees the matter quite differently. Although "well-intentioned," the CAIR campaign "was not a serious effort," Roulac says. "They had no money to start with, no endorsements from anybody of consequence politically." Crucially, he added, the California Farm Bureau opposed the initiative, and "unless you have the farmers supporting you, you're not going to get very far." IN THE VIEW of Santa Rosa hemp entrepreneur Richard Rose, another CAIR member, the critical failing was in starting too late. "It was a matter of a really good idea, but too little, too late," says Rose, whose HempRella company produces non-dairy cheese and other hemp-derived food items. "If we had gotten started on it earlier, there would have been enough money to push it through." Many of the CAIR activists are now hoping to pursue their goal through the state Legislature, and they have tabbed state Sen. John Vasconcellos, D-San Jose, as a lawmaker willing to carry such a bill. Failing that, "we'll definitely be back with another initiative, probably in 1999 or 2000," vows Kane. "By the year 2000, I will be surprised if we even need it," suggests Rose. "I think we will be there by then." The source of his optimism lies not in Sacramento, however, but in Kentucky, where a coalition of farmers has filed suit against the federal government to force hemp off the federal Drug Enforcement Administration's list of controlled substances and transfer it to the jurisdiction of the Department of Agriculture instead. "We've all, for years, been shaking our heads over why the DEA has been so adamant about saying hemp is marijuana, when any third grader can tell you the difference," Rose says. Now he thinks he knows. "Their cannabis-reduction program is based on big numbers, and 99.28 percent of the plants they dig up are industrial hemp," Rose charges. This insight into the agency's accounting came from careful analysis of an internal DEA report, which also revealed that the agency's budget equaled about $3,000 for every plant it uprooted. "What that is, is a negative subsidy for industrial hemp," Rose concludes. If the same funds were redirected to support hemp growing--which has been advanced as an ideal alternative crop for tobacco farmers in the South--the new industry would quickly be able to compete with imports from Canada, where hemp cultivation was recently legalized. The farmers' suit contends that the 1937 Marijuana Tax Act specifically distinguished industrial hemp from marijuana, and that the DEA has improperly included hemp in its drug enforcement actions. If that suit is successful, the basis for all state laws outlawing hemp will have been removed, and anyone who wants to should eventually be able to resume hemp farming. "The farmers understand this, and they want to grow it," Rose says, "so it's really none of the drug warriors' business." From the June 4-10, 1998 issue of the Sonoma County Independent.